Cooling specialist Aqua Computer has announced two new products designed for those who find their compact M.2 sold-state drives (SSDs) are thermally throttling: the KryoM.2 Micro and KryoM.2 Evo. 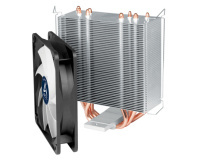 Building on the company's existing KryoM.2, launched last year, the new entries in the family are designed to sit closer to the budget end of the market: The KryoM.2 Micro is a simple passive heatsink, similar in design to existing heatsinks available for dual in-line package (DIP) chips, while the KryoM.2 Evo is an entire PCI Express add-in card for those whose motherboards lack native M.2 slots, who require extra slots, or who believe Aqua Computer's claims of top-quality cooling performance. The KryoM.2 Micro, to begin, is designed to cool any M.2 SSD in its original motherboard mounting position. A large black heatsink sits on the upper surface of the SSD, attached via a long thermal pad and a pair of slide-on clamps which the company claims do not subject the SSD's printed circuit board to any mechanical stress, and an additional sticker which prevents said clips from shorting out any motherboard components. The KryoM.2 Evo, by contrast, fits in a PCI Express x4 or larger slot and provides an M.2 connector sandwiched between a large front and smaller rear heatsink. According to Aqua Computer, this sandwich design is patent-protected and, naturally, offers an improvement in cooling performance compared to a single-sided version. Each adaptor board also includes orange-coloured LEDs arranged in a ring around the larger heatsink, which can be toggled on, off, or set to reflect the activity of the SSD; an additional logo on the rear lights up to reflect drive activity. Aqua Computer has indicated it will begin shipping both models alongside the existing KryoM.2 soon, priced at €9.90 for the KryoM.2 Micro and €34.90 for the KryoM.2 Evo (around £8.45 and £29.79 respectively, including VAT). More information is available on the company's official webshop. 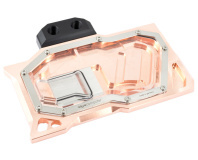 Thus far, the company has not confirmed plans to offer an add-on water block for the KryoM.2 Evo, leaving the original KryoM.2 as the choice for anyone looking to add their SSD into a cooling loop.